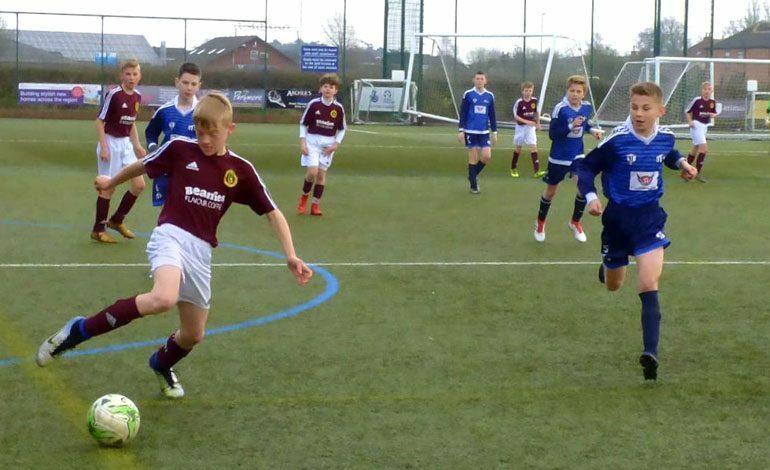 It was a mixture of midweek and weekend fixtures with the Aycliffe Juniors teams squeezing games in as they look to fit in the matches lost to the weather. The Under 6’s Development team enjoyed a Friday night joint training session with Sunderland Rokerites on the 3G pitch. There were 13 Aycliffe players involved equally over four mini games. Denver and Dan both scored goals and all the players enjoyed the game. The Under 8’s played twice in midweek, first facing Norton & Stockton Ancients ‘Black’ and then Seaton Carew. Against Norton & Stockton there were two goals each for Kenyon, Stephen and Dylan in a 6-2 win with Jamie named as man of the match. The development game saw Dylan and Oliver both score hatricks in a 6-0 victory. Then against Seaton Carew they narrowly lost 5-4 in the league game. The four Aycliffe goals came from Kenyon, Thomas and Dylan (2) with Zeke named as the man of the match. The development game ended with a 7-5 win and goals scored by Thomas (3), Kenyon (2), Stephen and Josh. The Under 9’s ‘Claret’ played Crookhall Beck ‘Blues’ who were last season’s league winners. A great first half effort kept the game level at the break. Two quick goals in the second half then gave Crookhall the lead. Aycliffe got close to levelling the score when Kai and then Harry nearly scored. Their were no further goals and the game ended in defeat despite a great effort against good opponents, Ashton was the man of the match. The Under 9’s ‘White’ were up against Velocity FC, the Aycliffe team showed a great attitude and their fantastic work rate was epitomised by man of the match Flynn. Velocity though proved to be the better team and ended the game as winners. The Under 10’s ‘Black’ faced Hardwick Youth who were a big physical team. Aycliffe though battled well and despite going a goal down Jake quickly equalised. It was Jake who went on to add two more goals to get his hatrick and secure a 3-1 win. Jack Louis was the man of the match for a great performance in goal. In the development game Jack Gibson scored and Jake Smith was the man of the match in a 1-0 win. The Under 10’s ‘White’ had a midweek trip to play Norton & Stockton Ancients ‘Amber’ but continued rain saw this game called off due to a water logged pitch. On Sunday they played Bishop Auckland Kings in a tight game which they lost 2-1, Harvey got the goal and Oli was man of the match. They won the development game 4-3 with Aidan (2), Jack and man of the match Dom scoring. The Under 11’s planned to welcome Billingham United Hornets to Sunnydale but due to their pitch being unplayable they reversed the fixture. The travel was worth it to see a stunning long range goal from Alfie. Charlie Brown also scored but both goals were in vain as they were beaten 4-2. The Under 12’s TJFA League team had two away trips this week, first to Marton FC ‘Blues’ and then to Leven. At Marton it was Aycliffe who looked the stronger team but they went two goals down early in the second half. Two Charlie D goals got the game level but it was Marton who got a scrappy winner as the game ended 3-2. At Leven it was the Aycliffe team who dominated the game and there were six goals scored with one each for Lucas, Will, Alex, Jake P and both Charlie’s in a 6-1 win.